German manufacturer Alstom has stopped testing its 14 emission-free trains after a fuel technician accidently over-filled both its main and two temporary reserve tanks while he took his compulsory two hour lunch break. The revolutionary technology promises future low cost transport with only water in its exhaust. 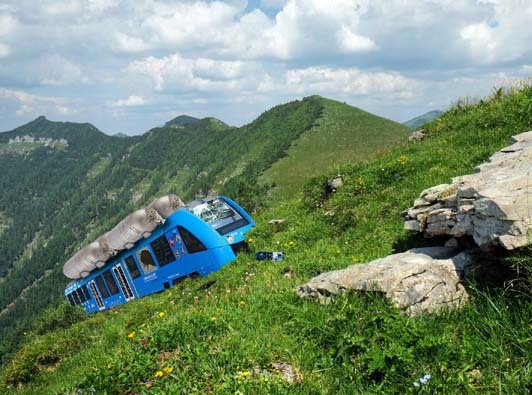 The 38 tonne locomotive floated up and away from the test track near Partenkirchen Oberammergau and was later spotted by a shepherd, lodged on a rocky hillside in the nearby Bavarian Alps.